The recent popularity of long wilderness hikes that was spawned from Reese Witherspoon's Wild has highlighted some disturbing information of hikers irresponsibility of their environment. Partying, trash, and bodily waste seem to intrude on what was once a spiritual and personal communion with nature. The Appalachian Trail, a 2168.1 mile footpath from Georgia to Maine, has also felt the pressures of the popularity. About 1 in 4 “Thru-hikers” walk the entire trail, but most are populated with section walkers and flip-floppers leaving more than their share of footprints. Bill Bryson's 1998 travel book on his attempt to walk the trail with his friend Stephen Katz is probably a better read with it's discussions of the trail's history, ecology, plants and people than the movie version by director Ken Kwapis from a screenplay by Rick Kerb and Bill Holderman. 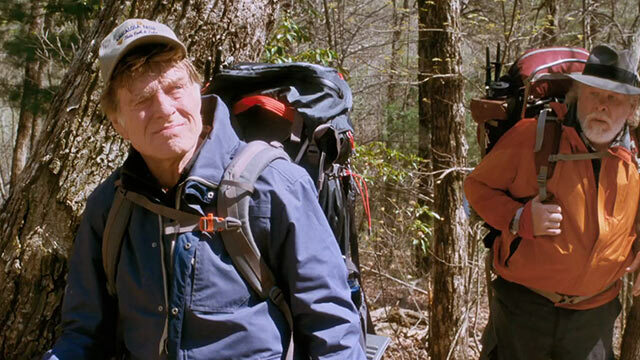 The movie tells of an older Bryson (Robert Redford) who hasn't written a book in awhile feeling somewhat amiss in life when he comes upon the path of the Appalachian Trail while on a stroll. He informs his wife (Emma Thompson) who gives him some scary clippings of the dangers and strongly suggests he bring someone with him. Everyone turns him down until an old friend who he once travelled with in Europe gives him a surprise call saying he's interested. Stephen Katz (Nick Nolte), an ex-alcoholic womanizer, is hiding out from an open warrant on him. The two had never really gotten along well, but Bryson agrees to his participation. There is the expected situations of two out of shape old guys attempting to carry heavy backpacks up inclines while panting after only ¼ mile of trek. Along the way they encounter annoying hikers (Kristen Schaal), bears, weather, and long discussions of their younger lives and regrets. Redford, a bit craggy, still looks pretty good without the use of Hollywood plastic surgery help. Nolte as the gruff Katz is overweight while huffing and puffing but still manages to get into some woman trouble along the way. The dialogue between the two and their adventures along the way play for some big laughs. The script also tries to insert some geological and nature facts in between some of the most amazingly beautiful vistas of the Smoky Mountains. Nick Offerman does a bit part as the REI salesman who shows how hiking equipment is not only well produced, but is also exorbitantly priced. Mary Steenburgen shows off her winning smile as the small motel owner who makes eyes at Bryson. While most of the target audience for this film seems to be an older group, younger folks will also enjoy the buddy comedy of two very good seasoned actors.